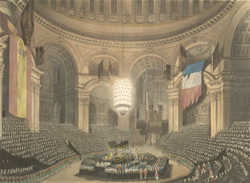 Nelson was given a splendid state funeral and burial in St Paul's cathedral in January 1806. The great cathedral dome was brilliantly lit by a huge chandelier, hovering just above Nelson's magnificently decorated black coffin. The coffin was lowered into the crypt, and into a sarcophagus intended for Cardinal Wolsey. This was engraved from a drawing made by Pugin during the time of the ceremony.